Right! Lots of progress over the last few weeks! 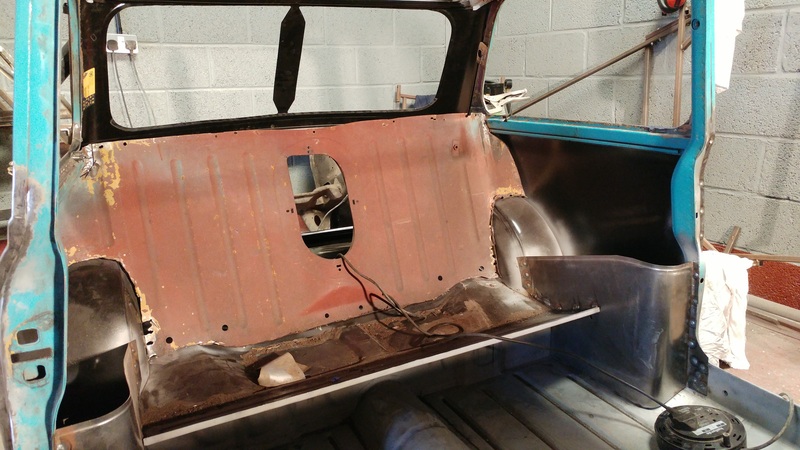 After pretty much finishing the floor and door steps, we turned our attention to the rear of the car. I always knew almost every panel needed replacing, so here's how it all happened. First up were the rear quarters. I think the car had been used as a racer at some point in its life, because both quarters were pushed in and full of filler. 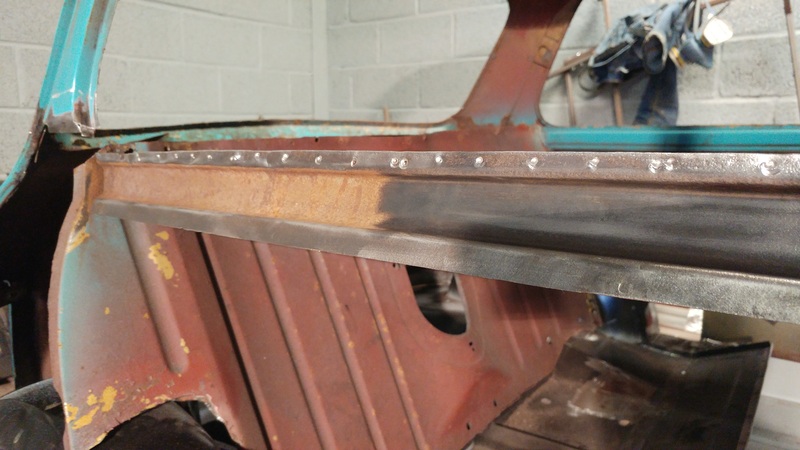 We set about drilling out the spot welds on the B pillar and along the waist rail between the B and C pillars. I knew the rear panel was coming out later too so I just used a cutting disc up that seam, and again to make horizontal cuts along the B and C pillars. This is what I was left with (albeit minus the new companion bin obviously). A quick lick with the wire wheel uncovered the relatively good metal underneath. After lots of measuring and re-measuring, we then joggled a step into the B and C pillars and offered up the new quarter for final fitting. 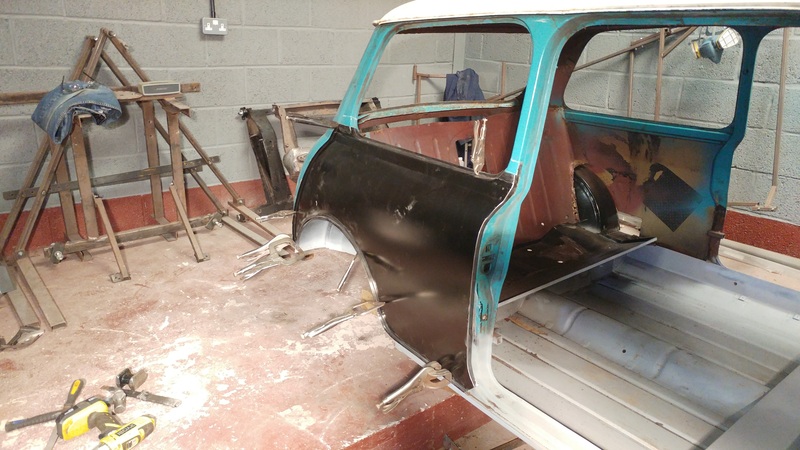 Just before the final fit I also popped in the little strengthening panel which sits in between the inner and outer sills and locates on the closing panel just forward of the rear wheel arch. The fit of the quarter was perfect, which wasn't surprising considering it was mating to a brand new floor, a brand new boot floor and brand new wheel arches. Still, I suppose it validates all the measuring and jig making we carried out earlier on in the build. 'Measure twice cut once' and all that. 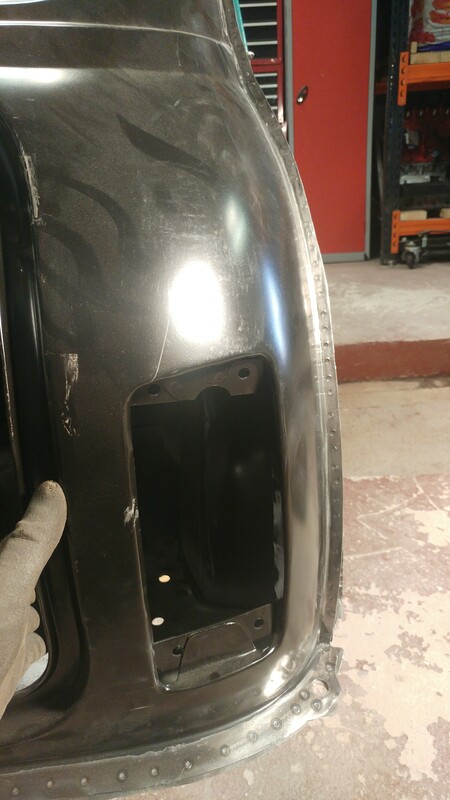 Ellis drilled and plug welded along the B pillar, and seam welded the horizontal cuts while I spot welded what I could along the outer sill and wheel arch (more on that later, it was a whole world of hurt). I couldn't help but offer in a wheel that was lying about. I suddenly saw it as a car again rather than just a series of expensive bits of metal stuck together. i know I'm a million miles away from finishing, but this was strangely exciting and motivating. I won't bore you with pictures of the passenger side. Rest assured the process was exactly the same just a little more tedious due to it being the 2nd time of doing it! Here it is finished anyway. 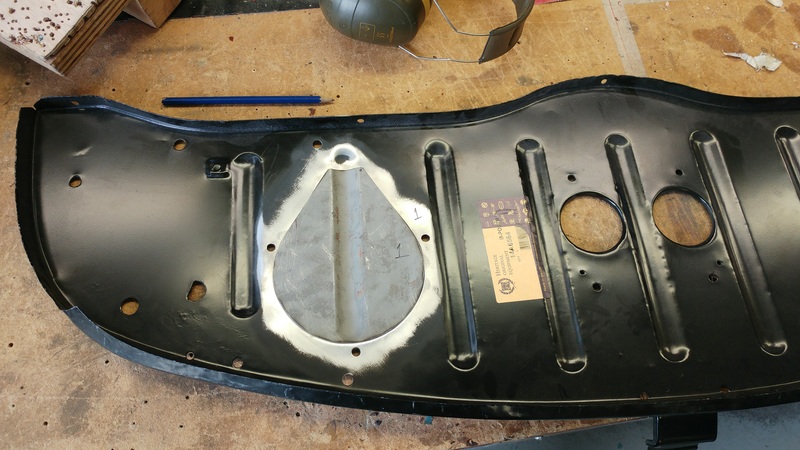 Next up - Rear Panel. Edited by SamG, 27 August 2017 - 06:18 PM. Your doing a great job on that! Before I get on to the rear panel I should tell you about the trouble I've been having with the spot welder. 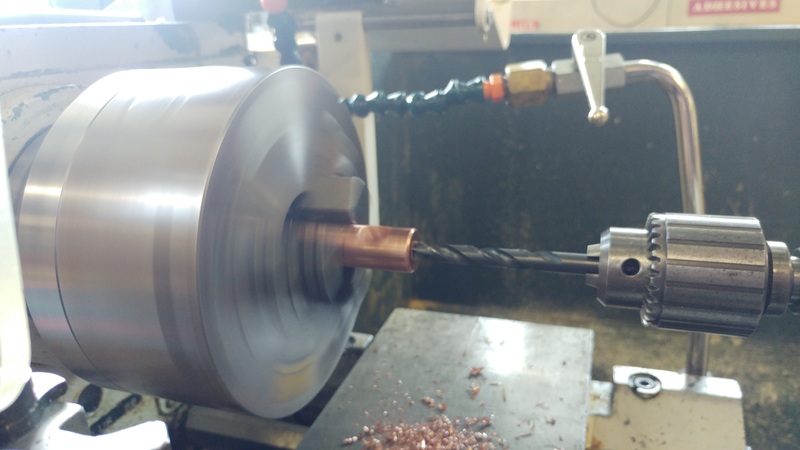 It's always worked well, not perfect but well enough to keep using it as opposed to drilling, plugging and grinding hundreds of times. While using it on the quarters however it was behaving really badly, blowing out almost every weld and sparking like crazy. I did some trouble shooting and it turned out the gap between the tips was slightly too large meaning that when the handle was depressed and the micro-switch engaged, there was insufficient pressure on the 2 panels I was trying to weld. This problem was worsened by having to use the longer arms with the angled tips. I could hone in the settings quite well using the short arms, but when using the longer arms I just couldn't get the settings on the welder right. "Why not just use short arms?" I hear you say. 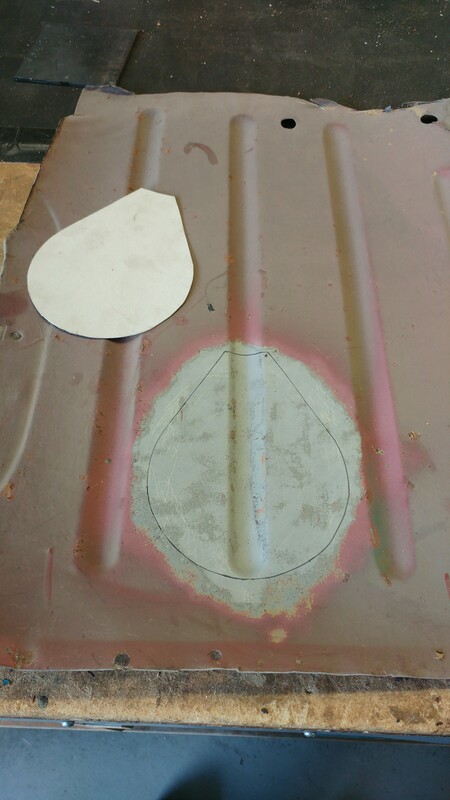 The problem is that the tips are set in 10mm or so from the end of the arm so when you offer the welder up to the car, the arms foul on the bodywork before the tips can make contact with the (5mm at best) seams. We decided that rather than forking out for new short arms (with angled tips) I'd try and bastardise the other end of the arms we already have. 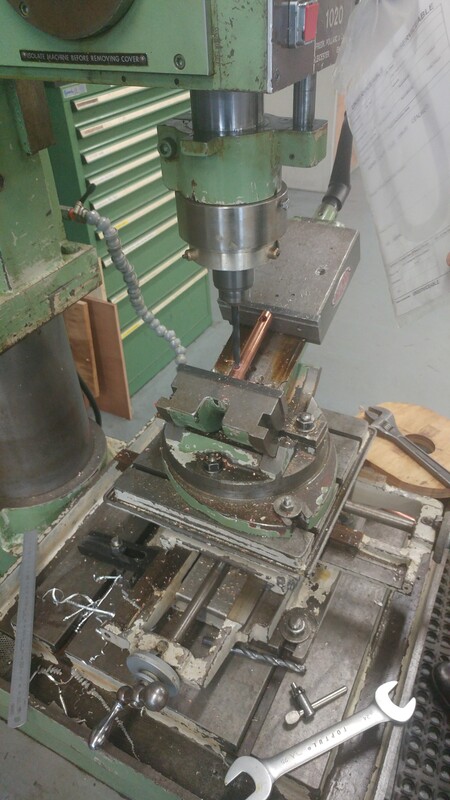 Luckily the next workshop over from me at work is a machine shop, so I took the arms in to modify the next day. First job was to set the angle on the pillar drill by using the long angled arms as a datum. Once the bed was set at the right angle I clamped in the short arms and nervously drilled out the new hole, gradually stepping up from 2.4mm to a final size of 12mm. Once both were drilled out the next step was to drill out the end of each arm and tap a thread for the grub screw that secures the tip in the arm. I used them today for the first time and thankfully they work a dream! Edited by SamG, 27 August 2017 - 07:27 PM. 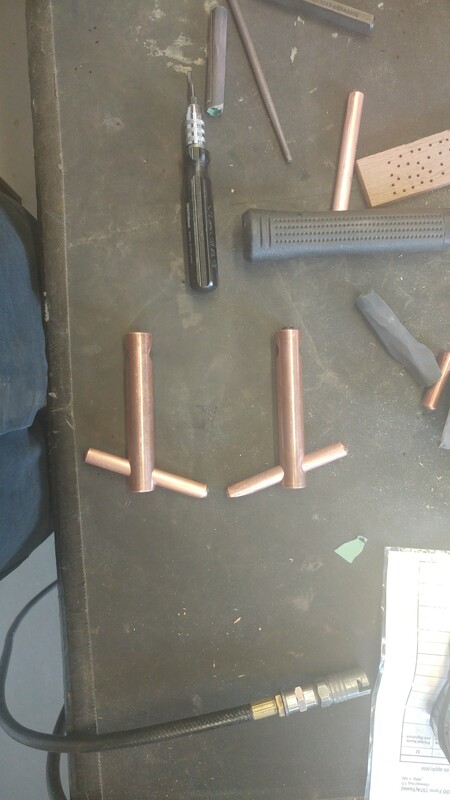 Along with the modified spot welding arms I've also been doing a few other odd jobs during a very quiet period at work. 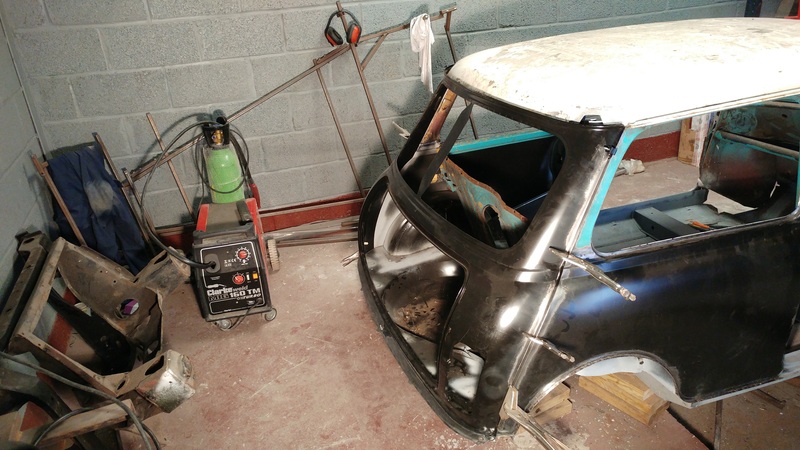 In a bit of a break from bodywork I've been stripping and shot blasting a few suspension components, the idea being that whenever the car get painted in the very distant future I'll have the subframes built up and all the associated components ready to go to make it a rolling shell. 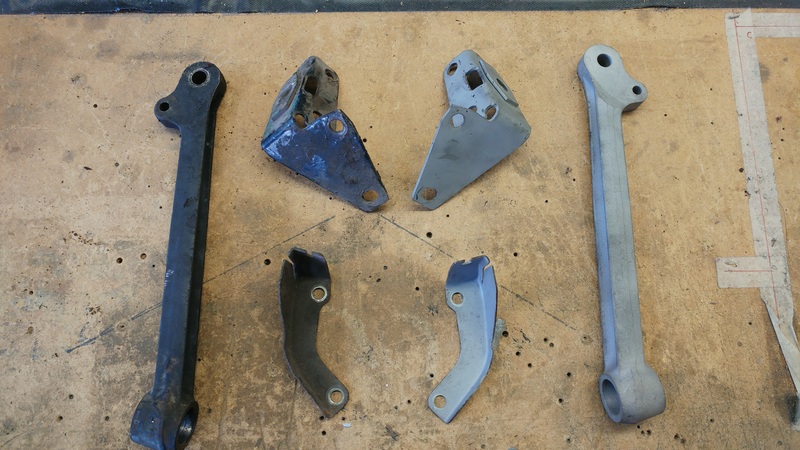 Radius arm stripped down for blasting. I'll be trying to restore as much of the original bits as I can without compromising on safety. New brakes all around are a given, but things like the back plates, camber and handbrake brackets, suspension arms etc will all be blasted and painted where possible. 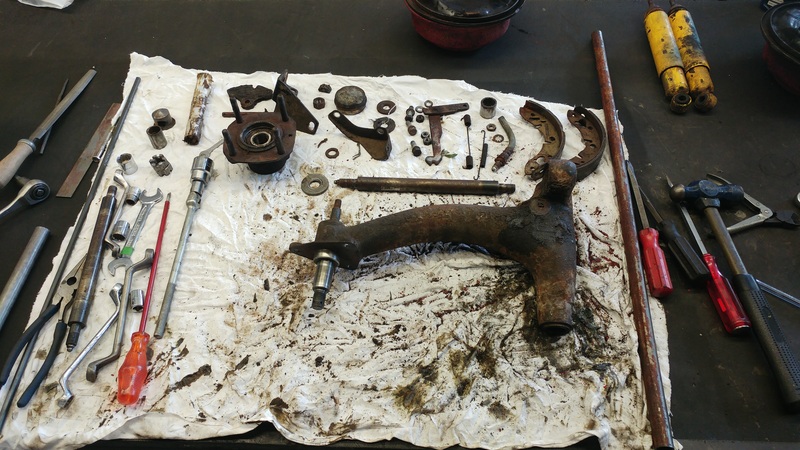 I'm planning on rebuilding my existing radius arms too. I bought the Minispares radius arm rebuild kit which is pretty much all you need bar getting the new brass bush reamed out which I can do next door in the machine shop! Edited by SamG, 27 August 2017 - 07:15 PM. Managed to get up the unit for a few hours over the last couple of days so here's another update. 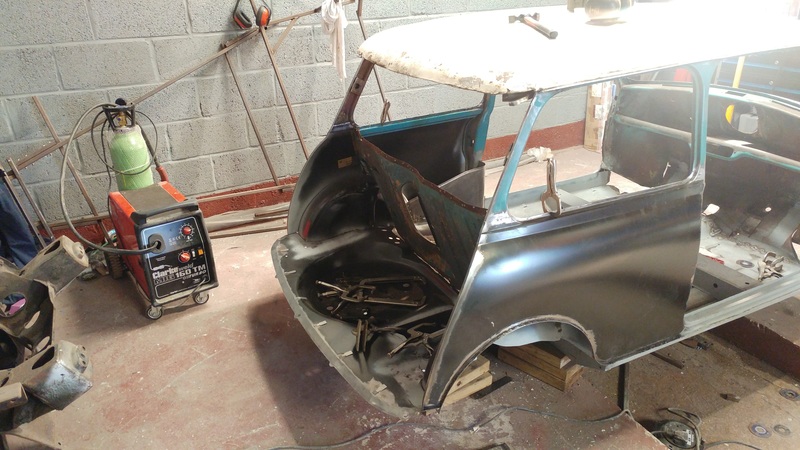 The next panel to get the removal and replacement treatment was the rear panel. 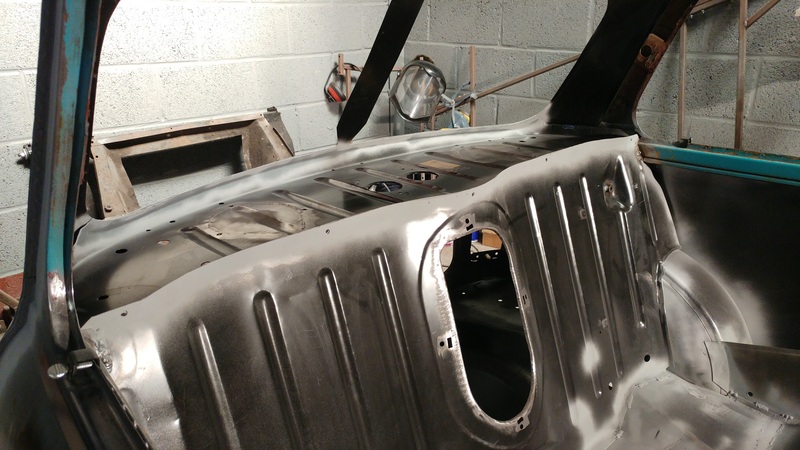 I decided to go for a full new panel as there was little bits of rust and damage all over the old one and as you've probably gathered I'm not in the business of patching up here and there. I know it detracts from the originality of the car and some may view it as cheating, but the fact is it would have taken me 2 or 3 times longer to make the amount of repair patches the car needs. Plus I don't want to have to restore the car again in 5 or 10 years, I want to do it right and do it once! 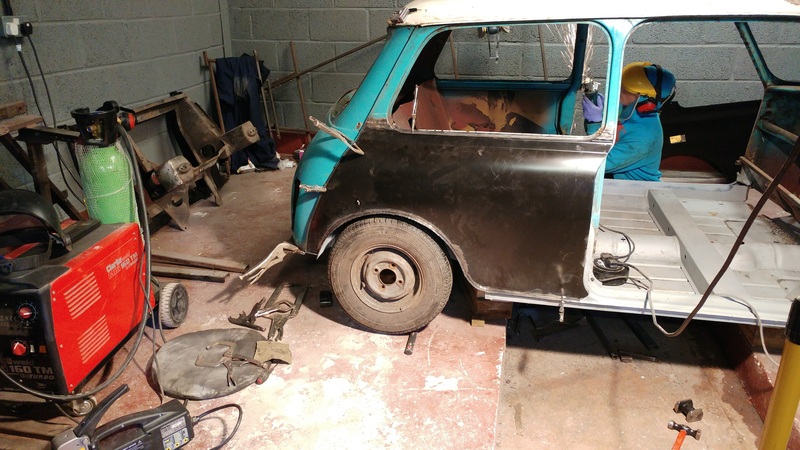 Anyway, here's the scary pictures of a mini without a bum. I was actually at work when Ellis did all the hard work of removing the panel so this was the sight I was greeted with the next day! 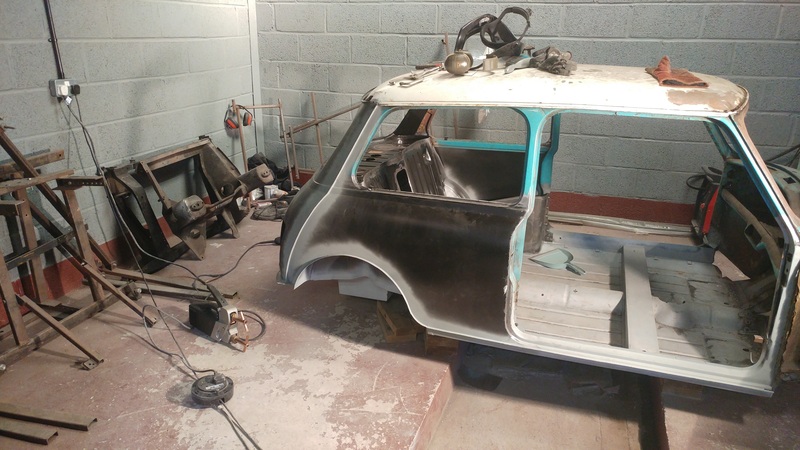 Due to the amount of new metal I'm putting into the shell you may scoff when I say I'm going for a car with largely original features when finished. Because of this I was disappointed to learn that you can no longer buy a rear panel with the older style drain slots cut into them. You can only buy a 'Mk4 on' rear panel with the the little cutaway drain where it meets the side panel gutter. So for now I know the panel is incorrect, but it will be getting modified later! Now I'd been trying the save the roof for a long time as I was conscious of how much 1972 I was cutting out of the shell, but it really wasn't a viable option. 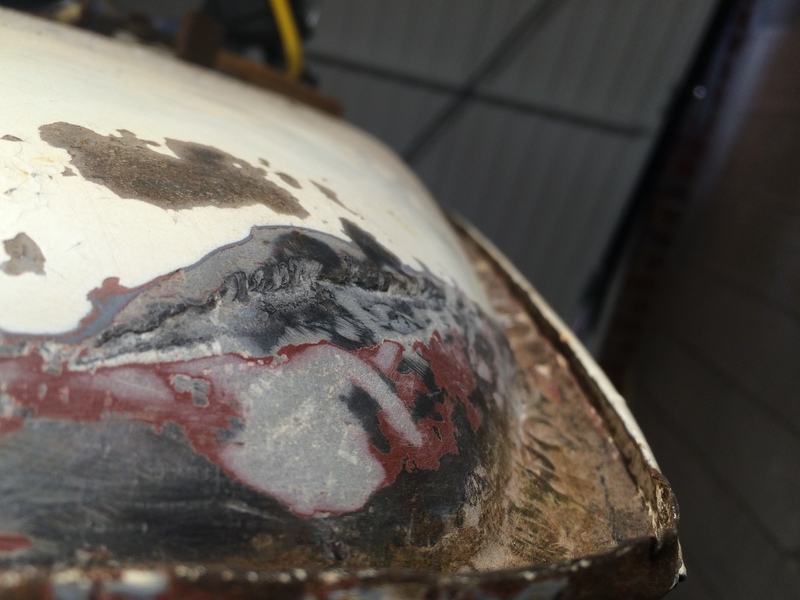 It had already been patched (badly) and filled (badly) in all 4 corners and was dented and holed along the gutter. Hopefully the pictures below show what I mean. I really should have walked away from this car shouldn't I? 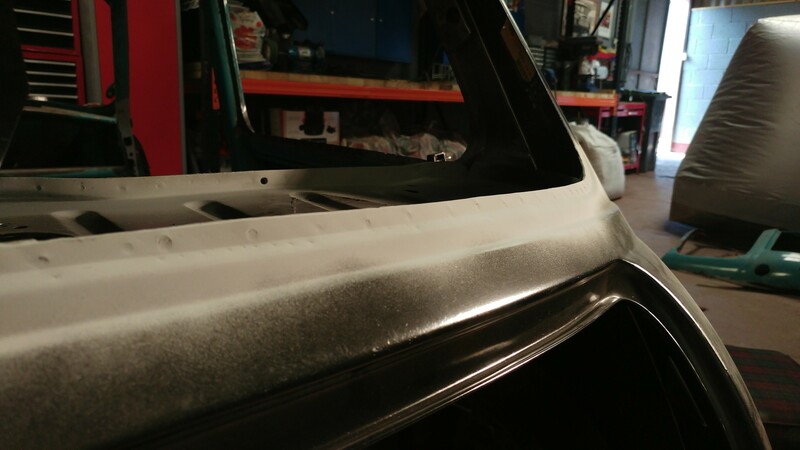 The new rear panel came with the rear section of the gutter and cant rail, so the decision was made to cut along the roof and replace it all later. Here's the new panel offered in. The fit was good, just a small 2mm or so gap to the N/S quarter/C pillar seam that we pulled in to match. It was a slight concession but the only way of making it fit perfectly, and I'm confident you can't see it now it's all welded together. The spot welding was pretty frustrating at first (due to the issues detailed above) but after I sorted the welder it went quite smoothly! Edited by SamG, 29 August 2017 - 07:33 PM. 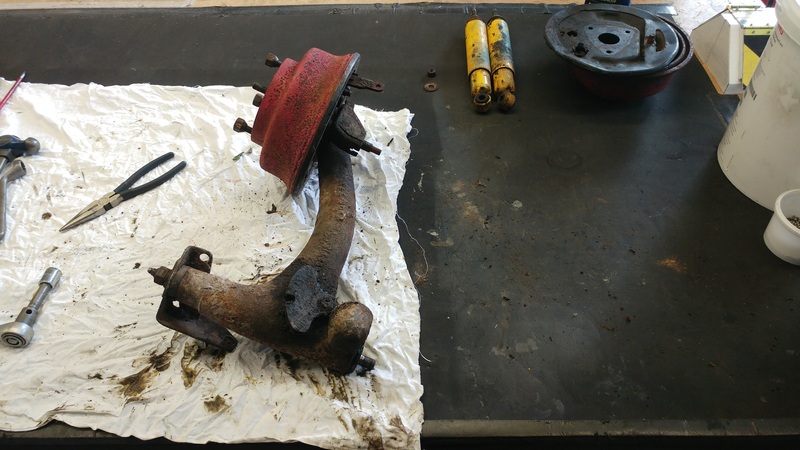 Next up was the rear bulkhead which was originally in quite good condition bar the bottom inch or so which was strangely rotten so again I was hoping to save it. However, (are you sensing a theme here?) 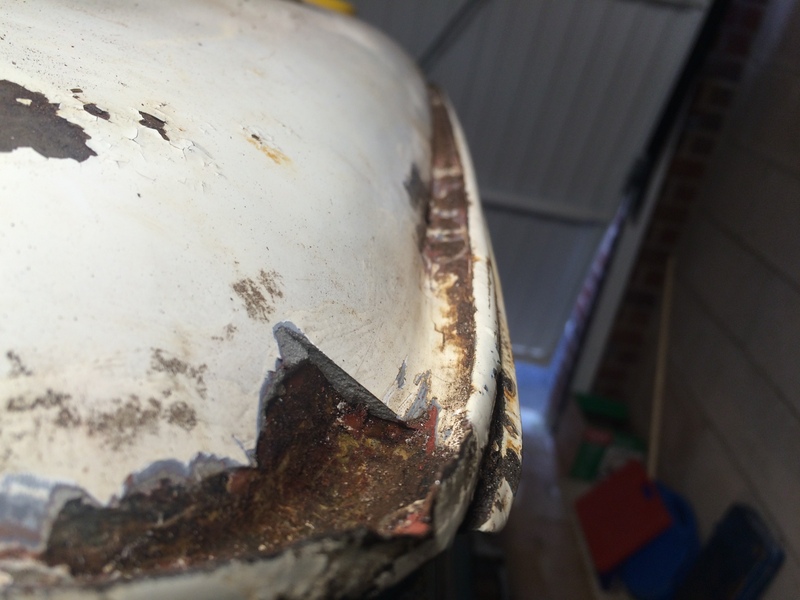 after previously splitting it from the 2 wheel arches and the old boot floor, it wasn't really worth saving. So out it came. Thanks have to go to the chaps and chapesses at M-Machine for the period hole in the bulkhead. As I understand it, as it's a heritage panel they normally come with either the earlier smaller hole, or the later version with no hole at all. 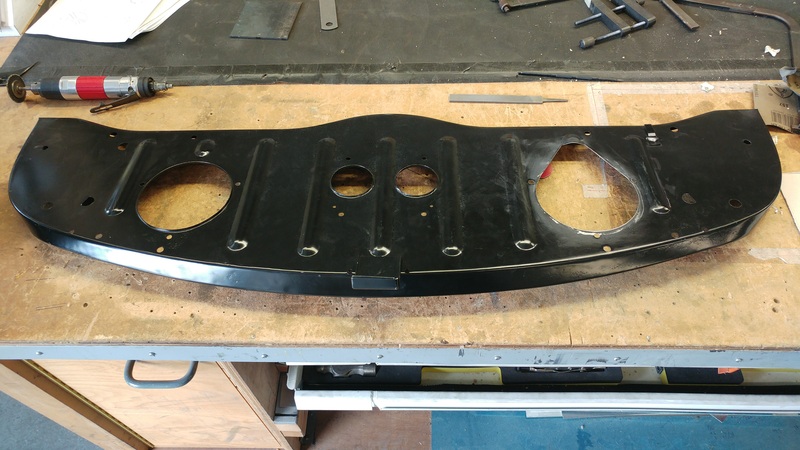 After a quick chat with Doreen and sending them a picture of my existing bulkhead when I placed the order she said they'll recreate the 'Mk3 hole' for me. I was really happy when I saw how it turned out. It was actually a very quick job really as the fit was pretty much spot on from the start. It slotted into the gap between the arches perfectly (which thankfully means I welded the arches in the right place!) and over the little hump in the the centre of the boot floor. 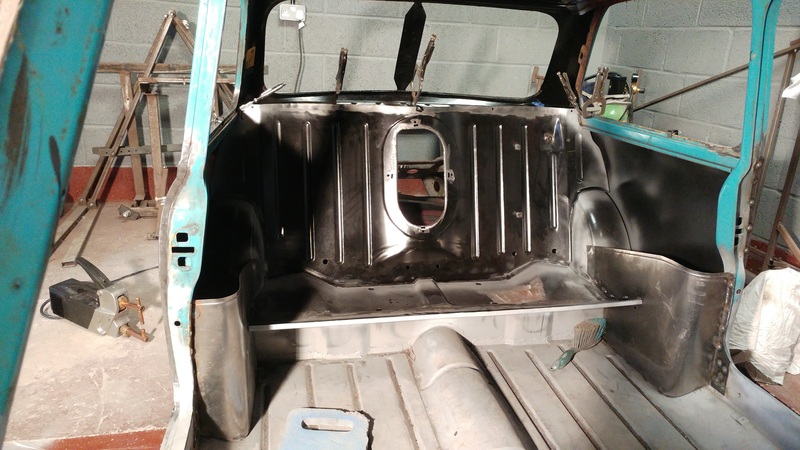 So once everything was cleaned up and prepped, Ellis seam welded along the bottom and at the existing waist rails. 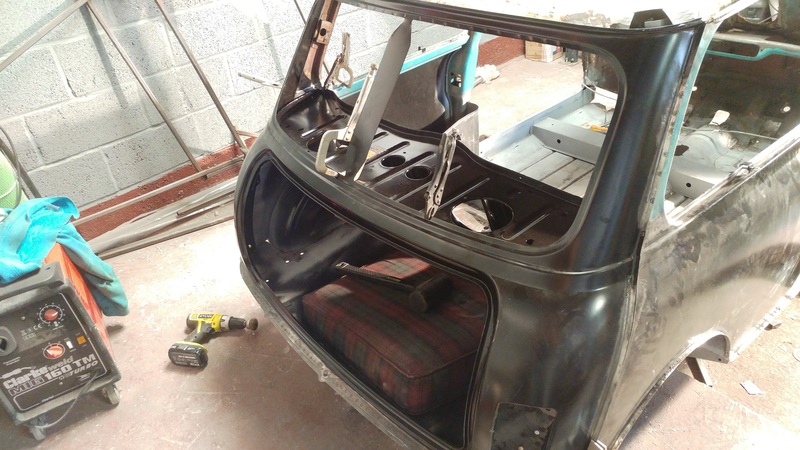 EDIT - Forgot to say, when we offered in the bulkhead for final fitting, we also fitted the new parcel shelf to set the bulkhead the correct distance away from the rear panel. Edited by SamG, 29 August 2017 - 07:49 PM. 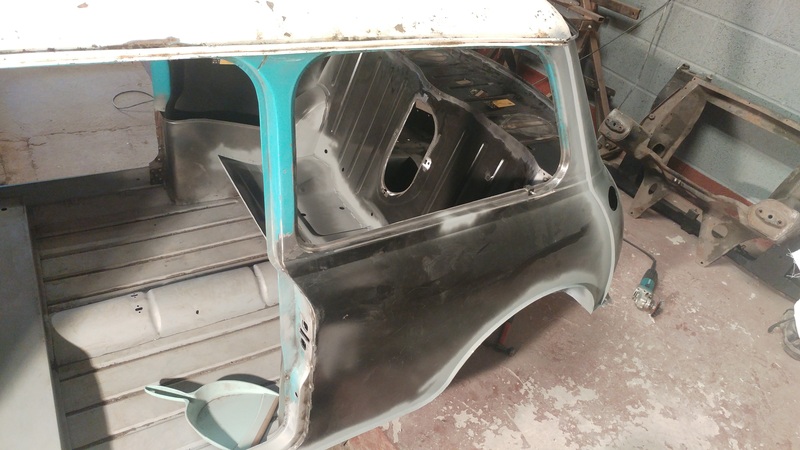 Unfortunately as with the rear panel you can no longer buy the correct parcel shelf for the period, only the later one with speaker holes cut out. 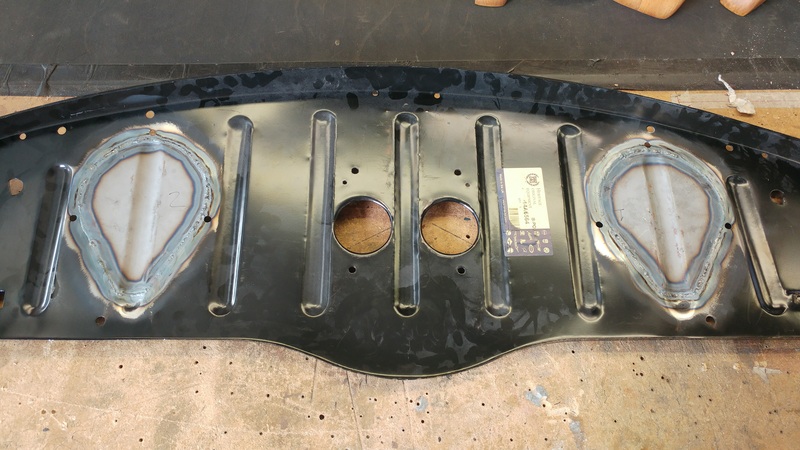 As this car won't have a radio when (if) it's finished, and because I work in a sheet metal workshop, I decided to create some little blanks to fill the holes and create the illusion of an original panel! The only sticking point would be the flutes that are in the parcel shelf, they'd be a real pain to recreate without the correct tooling. As it happens I DO have the right machine at work to create the flutes, but don't have a die with a wide enough profile to match . 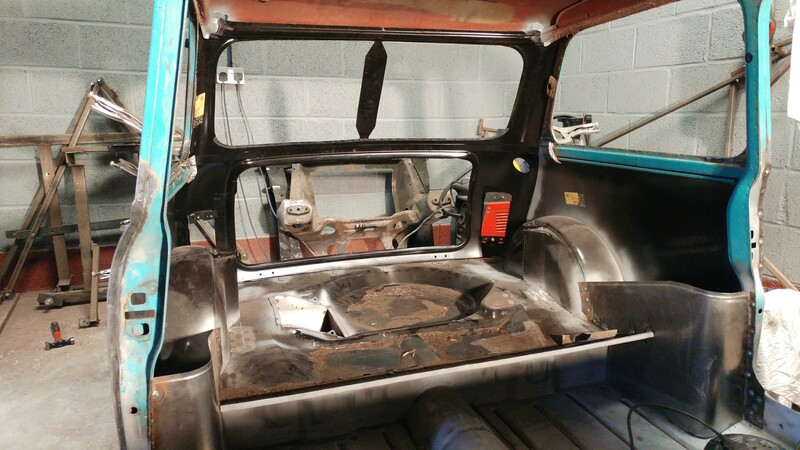 As I'd just removed the bulkhead, I had the idea of cutting sections out of it and welding them into the parcel shelf as blanks. 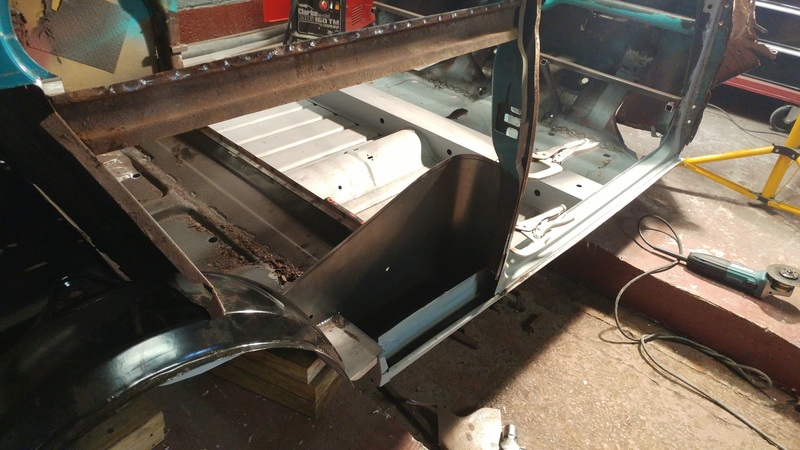 This achieved 2 aims - to get the correct sized fluted into the parcel shelf, and to keep a little bit more 70's steel in the shell! Completed panel fresh off the welders TIG table. It's amazing how much strength is in the rear end of the car. It really does fell solid and in 1 piece which is a great feeling! looks fantastic mate, what primer are you using? etch? upol 2? have you had any long term experience with it? Another shout out to my good friend Ellis who has given up a few weekends recently to help me. I certainly wouldn't have made as much progress without him! Funds have largely dried up for the next couple of months so it's just going to be more blasting and painting of suspension components for now before we move forward and towards the front end. I also have a fair bit of grinding to be getting on with on the toe board and companion bins which will keep me busy. Also the little rear seat support needs welding in, as does the handbrake cable bracket, ash tray mounts, and a few other closing panels I have lying around. So plenty to do! Thanks! The floor is painted in this - http://www.rust.co.u...-primer/c32736/ which is good, but a pain because it has to be applied with a brush if you don't have spraying equipment. Certainly does the job though. I didn't fancy priming the whole car with a brush so I found this - https://www.bilthamber.com/electrox which comes in a handy aerosol. I've only been using it for a month of so but have read of others leaving it uncovered outside for a year or more with no adverse effects. It seems like a really good paint so far. The whole car will be be getting blasted eventually so it just has to last until then! EDIT - The downside of etch primer is that it's porous so it's no good for long term protection. Both of the primers above will not absorb moisture so should last a long time! Edited by SamG, 29 August 2017 - 08:15 PM.